They played lots of times at the Edgar Allen Poe Club in Holland during that time as well as the Beach Bash dance club in Grand Haven, MI and many other clubs as well. 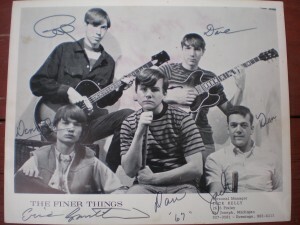 They did record a 45 rpm record “In the Night” and “Young &amp; Carefree” at Chess Record studio in Chicago. No real fame or fortune, but what GLORY DAYS !!!!!!!!!!!! 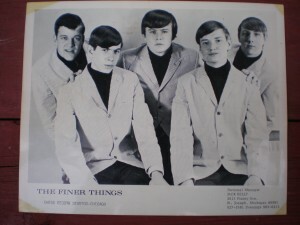 First picture was our press photo from 1967. Left to right is Dennis Hanson, Paul Hass, Dan Stice (me), Dave Hicks, and Dennis Miller. The signature bottom left is that of our sound man/road mgr (not pictured) Eric Smith. 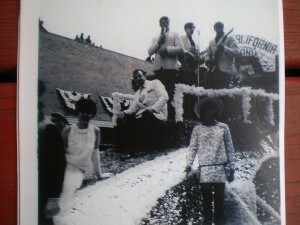 Second picture is our press photo from 1968. Left to right are Dennis miller, Paul Hass, Dan Stice (Me), Dennis Hanson, and Dave Hicks. 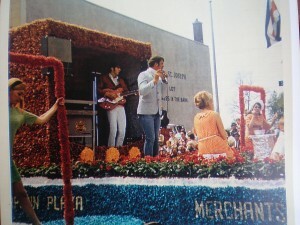 The 3rd & 4th pictures (in Color) are of us on the Fairplain Plaza float with the theme “TV Land 67” in the Blossomtime Parade – taken near the press box in St Joseph, MI . 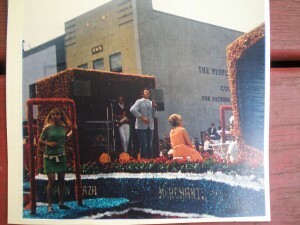 The 5th & 6th pictures are of us again on the Fairplain Plaza float in the 1968 Blossom Parade with the theme “California Movieland 68”. 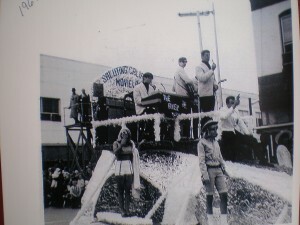 There was a gasoline generator down below us on the float to give us electricity to perform along the parade route. Back in those days the only place that had such a generator was the St Joseph Fire Dept. Blossomtime had to borrow it from them for the parade. I can remember the noise that thing made…….But we just played loud enough to drown it out. Also, the exhaust fumes from the generator were fierce!!!!!!!!! It’s a wonder we all didn’t pass out from them – of course we were having so much fun, we did not even care about the danger. Having performed along that 5 mile parade route, we could honestly claim that we performed for crowds in excess of 100 thousand two years in a row. The band members today are as follows: Dan Stice (Me) retired from the US Army after 25 years in 1993. I then went to work for our local County (Berrien),first as a Court Enforcement Officer, then as the Director of the Berrien County Veteran’s Service Office, and I just retired from that job in June. Dave Hicks has spent his post-band as a licensed electrician here locally and has just recently retired from Stouffer Electric in Benton Harbor. Denny Miller is a Senior Vice President with Chemical Bank near Grand Rapids. Paul Hass is an Inhalation Therapist with a Hospital down south (Nashville, TN last I heard). Dennis Hanson is living in California still writing music and performing there. Our business manager was Jack Kelly. At the time he was a disc jocky with WHFB Radio in Benton Harbor. Now he owns a very successful advertising business “Jack Kelly & Associates” here in St. Joseph. I stay in touch with Jack, Dave, and Denny Miller and would love to reunite for old times, but Paul & Dennis Hanson are pretty far away and that would make it a bit hard to do. Please feel free to post any or all of this email on the website. Thanks for keeping “the good days” alive & well. Thanks for sharing your email Danny. I shared this link with my kids so they could read a bit about the band their dad was in! I also posted the date he passed away on the Obituary page, I hope it went thru.